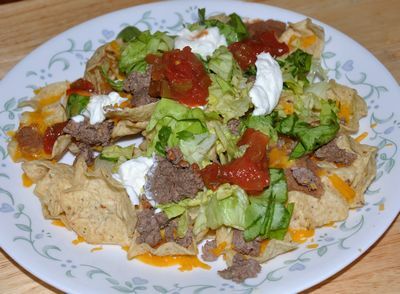 You can use multigrain tortillas for a healthy version when having nachos. 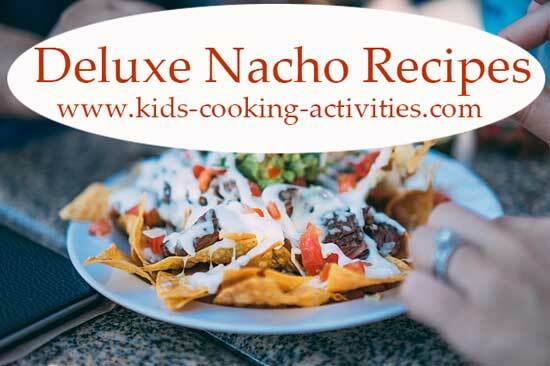 When making quick nachos add plenty of fresh salsa, chopped tomatoes, chopped olives for a deluxe nachos. Nacho cheese tortilla chips are personally my favorite but I rarely use them for nachos except for special treats instead I go for the multigrain or white corn tortillas for my homemade nachos. Brown ground beef and season with salt and pepper. Drain and set aside. Do any prep work needed such as chopped fresh tomatoes, lettuce, olives, shredding cheese, etc. To assemble your easy nachos, start by adding tortilla chips to a microwave safe plate. Drop refried beans by tablespoons on top of chips. Sprinkle with cooked hamburger, sprinkle with cheese. Microwave 1-2 minutes until cheese is melted. Remove from microwave. Top with tomatoes, salsa, shredded lettuce, olives, sour cream etc. 1) Put tortilla chips of any kind on a microwave safe plate. 2) Put the following in order: Dollop salsa on chips. Then sprinkle with cheese blend. Then take turkey and put it on the tortilla chips in little pieces. If you like you can add a little drop of hot sauce on each chip. 3) Put plate of nachos in microwave for the 20-30 seconds. For a lighter version use baked tortilla chips and lowfat cheese. Spread chips evenly out on a microwaveable plate. Sprinkle cheese over the chips. Top with picante sauce and cilantro. Microwave on high for 1 1/2 minutes. be careful it might be hot! 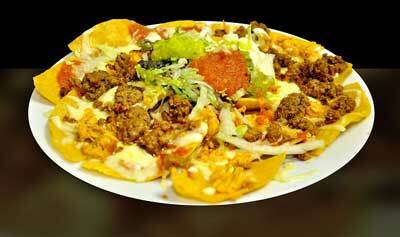 See more recipes from this making nachos page.